Reprinted from North Carolina's Best Wildflower Hikes: The Mountains, and used by permission. Directions: From mile 420.2 of the Blue Ridge Parkway, turn onto FR 816 (unsigned) and proceed 1.2 miles to where the road ends at a parking area. Mile 420.2 of the parkway is located 8.3 miles south of US 276 at Wagon Road Gap and 3.0 miles north of US 215 at Beech Gap. I include this hike (and the one to Shining Rock) with mixed feelings. This part of Pisgah National Forest is insanely popular, and the many people visiting the area exact a heavy toll on the ecosystem. Inviting increased visitation by including the hikes in this book could make matters worse. At the same time, the region is one of the most scenic in the North Carolina mountains, and in September the wildflower growth is superb. I believe that the readers of this book are environmentally aware and will tread lightly. While this is such an exceptional part of our mountains, it is ironic that its uniqueness is largely the result of human activity. In the early part of the 1900s, loggers removed nearly all of the red spruce and Fraser fir that blanketed these mountains. In 1925, a train locomotive sparked a severe wildfire that burned thousands of acres and sterilized the soil. Another major fire occurred in 1942, and the soil erosion that resulted from both wildfires contributed to the unique, open character of the land. and bush honeysuckle (with tight clusters of seedpods in September). You’ll see all these species growing prolifically along most of the hike, but the bluish purple asters and yellow goldenrods steal the show. There’s no point in telling you about the occurrences of these two species since they literally stay with you for the entire hike. The goldenrods alone make this hike one of the finest in the mountains. A few feet from the start, look for a view through the vegetation to the right. This is what you came here for: an open meadow carpeted with thousands of goldenrods. Our hike encircles this meadow, providing many more views. Wildflowers to look out for as you continue along the trail include heal-all, stiff gentian, and a white-flowered species of goldenrod called silverrod. It’s easy to distinguish stiff gentian from other gentians by its smaller flowers that grow in numerous thick clusters. A few American mountain-ash trees are scattered about, showing off bright red berries in September. At 0.1 mile you pass through a wet area (a common occurrence on this hike), with a nice patch of bottle gentian on the left side of the trail. Now you start to see Michaux’s saxifrage in the rocky areas, and dodder grows frequently among the thick trailside vegetation. 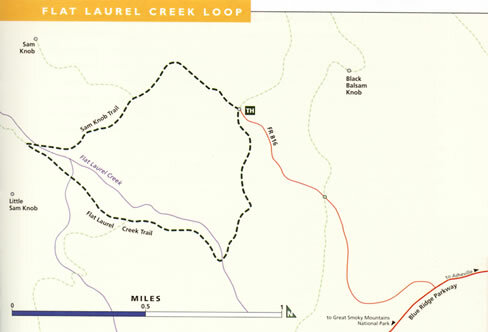 Come to the headwaters of Flat Laurel Creek in a little over 0.6 mile from the start. The scenic creek is easy to rockhop at this point, and, once across, the trail swings around to the right and heads west. Sam Knob, the imposing peak you’ve been seeing off to the right, now lies directly in front of you, and soon you get a good view to the right of Black Balsam Knob. The trail continues to be wet and rocky, and now it descends moderately. St. John’s wort grows in dense patches along this stretch, but you have to hike in early August to see it in flower. A patch of bottle gentian is on the left, and on the right is eastern longleaf bluet, mostly finished flowering by mid-September. Another bluet species, thyme-leaved bluet, has been abundant since the start, but in September you probably won’t see any flowers. Boneset is another species you might see now for the first time. Both boneset and eastern longleaf bluet become common sights for the next little while. and reaches a trail junction at 1.1 miles. Little Sam Trail forks to the left, while our hike continues to the right and descends through the forest. At 1.25 miles you pass by a scenic grove of yellow birch, with a ground cover of ferns, white snakeroot, goldenrod, and aster. About 100 yards farther is a dense patch of coneflower on the right. It’s mostly gone by mid-September, but a few flowers might still be hanging on. Beyond the coneflower patch you get an open view straight ahead of Little Sam Knob, and soon you come to a tributary of Flat Laurel Creek. Like the previous stream crossing, this one is scenic and easy to negotiate. After a little over 100 yards from the crossing, you come to the confluence of the two streams at a campsite. A few hundred feet farther, just before the woods open up, you have to turn right on Sam Knob Trail and cross the creek. A red spruce tree standing beside the creek has a blue blaze designating the route, but it’s easy to miss the junction. If you enter the open area, you’ve gone too far. Flat Laurel Creek is very scenic at the crossing, as it is for most of its run to West Fork Pigeon River. Normally this crossing is easy, but after a heavy rain it could be a little tricky. Beyond the creek, the trail opens into the meadow with views of both Sam Knob and Little Sam Knob. After passing by a campsite you need to stay to the left (look for blue blazes), and shortly you cross a small branch. The trail becomes muddy, steep, and more closed in. It continues that way for nearly 0.3 mile. Just before you leave the field, a nice patch of blazing star grows on the left in a section thankfully left unmown. The ascent picks back up once you leave the field and begin the final segment of the loop. Field thistle grows abundantly along the trail, as does rattlesnake root and, of course, goldenrod. At 2.25 miles, the trail tops out among profuse filmy angelica, goldenrod, and field thistle. The remaining 0.3 mile is on a level course, with the red berries (turning to black) of hobblebush adding vivid color to the thick trailside growth. * Acclaimed photographer and North Carolina native Kevin Adams is the author of North Carolina Waterfalls, Wildflowers of the Southern Appalachians (with coauthor Marty Casstevens), Waterfalls of Virginia and West Virginia, Hiking Great Smoky Mountains National Park, Our North Carolina, North Carolina Then & Now, Backroads of North Carolina , and North Carolina's Best Wildflower Hikes .